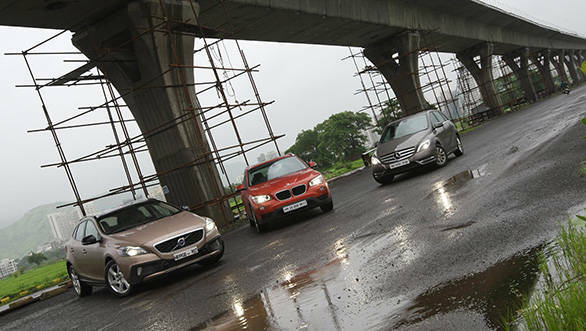 At first glance the BMW X1, the Mercedes B-Class and the Volvo V40 Cross Country might not seem as competitors at all. And it's understandable because the X1 is a crossover, the B-Class a mini-MPV and the V40, a sporty hatchback. The three straddle different segments in a way, and should therefore, at least in principle, appeal to different types of buyers. But, in reality these are just three different approaches to the same goal, and as a result, have a lot in common. These are all five seaters, run diesel engines with automatic gearboxes but, more importantly, these represent entry-level offerings for their respective makers. Okay, in Mercedes' case the A-Class is cheaper but the difference in pricing between the A and the B isn't much. Also, the B is a better fit in terms of size and pricing in the company of the X1 and the V40. The goal though is to sell as many cars as possible by going down the price chart at the luxury end of the segment. We really like the way the V40 Cross Country looks. It might be a hatchback, but it is large and sporty in equal measure. It looks so good in fact that we couldn't think of anything we would have liked different on the car. The interiors though not as racy as the car's exteriors, are still pleasing. These aren't just functional or understated in typical Swede fashion, but are extrovert and a bit funky too. The fully digital instrumentation with three different themes is a case in point. And it's tastefully done, so it doesn't look gimmicky. The design for the dashboard, the seats and even the doors and its handles looks classy and the fit and the finish, the build and the choice and colour of the material used gives the car's cabin an air of opulence. The V40 is also the best equipped car in this test. 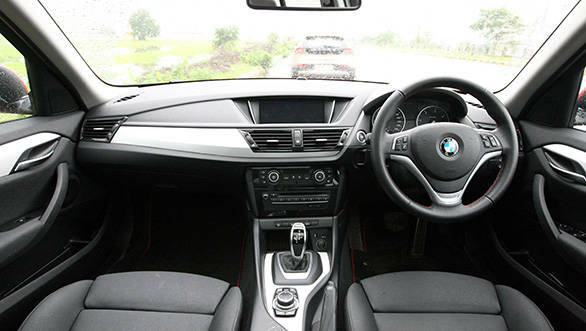 It has the regular kit available on the other two cars like a two zone climate control, a multifunctional steering wheel, electric adjustment for the driver's seat, a driver interface system with Bluetooth telephony and a some leather. But, additionally, it gets a reversing camera, park assist which steers the car automatically into a suitable parking spot, three modes for steering assist, and ventilated seats. It also comes with more safety features like seven airbags, bending lights and City Safety. The latter automatically brings the car to a stop by applying brakes if it senses impeding collision. The system only works under 50kmph. The one area where the Volvo loses out is rear passenger room. The rear knee room isn't bad, but because of the sloping roofline, head room is average at best. The Mercedes B-Class is the champion when it comes to space utilisation. It is smaller than the Volvo and the BMW in terms of length and sits on a smaller wheelbase compared to the latter as well. But the space offered for occupants both front and back is easily the most in the B. Its mini-MPV design helps here. Things like the tall roof or the lack of overhangs which rob the B-Class of a dynamic stance help liberate the best in class head and kneeroom. The shoulder room at the rear is good too thanks to the flat-ish side panels. The BMW X1 takes the middle road. It has more usable space and easier ingress than the Volvo but it can't match the B-Class on these counts. It does get more equipment than the B, though, but again, the Volvo ticks more boxes. One might argue that the BMW's build and quality feel are inferior to none, and we agree. Unfortunately for the X1, the B-Class and the V40 are equally good. The X1 redeems itself when it comes to drivetrains. It easily has the best engine and gearbox combo. Even on their own, the BMW's nearly 2-litre, four cylinder engine and the eight-speed automatic gearbox are the best in this test. With 184PS, it is also the most powerful engine here and though the automatic it is coupled to lacks paddle shifters, the 'box remains the most alert and fun to use. The engine is also the most refined and easy revving. The figures on paper also translate into class leading performance on the road. The X1 manages a 0-100kmph time of 8.0s and it completes the quarter mile in 15.9s. 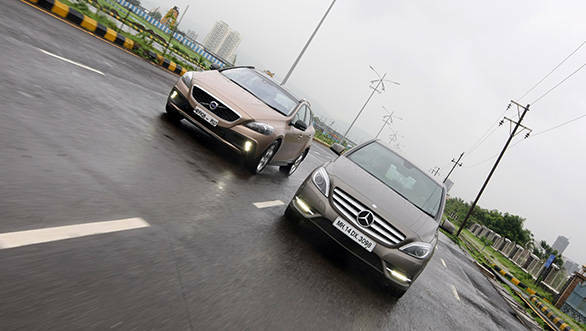 Compared to the next fastest car in this test, the Volvo V40, these figures are lesser by 1.5s and almost a second for the two tests respectively. And in kickdown, the BMW clearly is in a class of its own leading by over a second making it the most enthusiast centric and highway friendly car in its category. The Volvo's drivetrain in comparison feels unrefined, loud and a tad old. 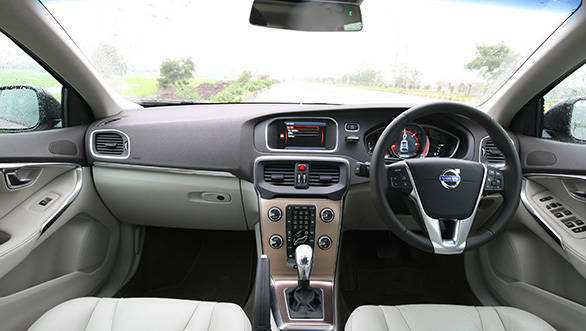 The V40's engine displaces about 2-litre as well but it uses a five cylinder layout. This is the same engine that is used on the XC60, but it makes lesser power and torque compared to the Volvo crossover. The V40 also only gets a six-speed automatic which is almost extinct in this class of cars with most having moved to seven or eight speed units. Nonetheless, the V40 still manages to pack a punch in the real world. The six-speed auto isn't slow and the torque spread helps the V40 to respectable times. A time of 9.5s to 100kmph from a standstill might not be breathtaking, but it isn't slow by any stretch. 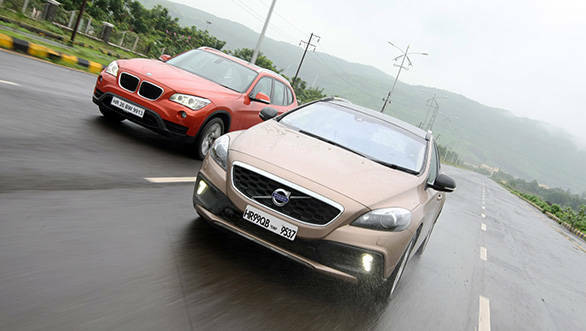 The Volvo's trump card, however, is its fuel economy compared to the X1. Given the engine and the gearbox specifications we would never have imagined the Volvo to beat the BMW in efficiency stakes, but it does, probably helped by its taller gearing. The Mercedes brings up the tail here. It is powered by a near 2-litre engine as well, only the Merc's engine has a capacity exceeding 2-litre. It is, however, the least powerful. This too isn't a new engine and like the Volvo, is already available on Mercedes' cars in India like the C-Class. But, on the B, the four cylinder engine only makes 109PS down from 204PS the same engine makes on the C 250 CDI. The B-Class does boast of the only dual clutch automatic in this test, though. And it has seven speeds. The gearbox certainly helps in the driving experience. It manages to hide the engine's sheer lack of grunt with its quick, well timed shifts ensuring the B is always running in its power band. So in the absence of a stop watch, or in our case, the VBOX, the B feels quite brisk. It is also the only car here to get paddle shifters which further enhances the driving feel. But, drive it back to back with the BMW or the Volvo, and the lackluster performance can be felt instantly. It's a lot more obvious after looking at the times the VBOX recorded. 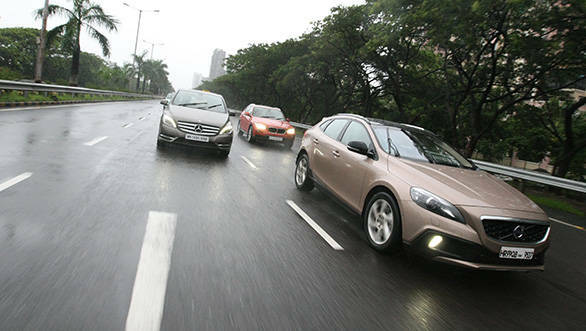 The B 180 CDI takes 11.6s to get to 100kmph, which is over two seconds slower than the Volvo. The difference in kickdown is equally telling and as they say - figures never lie - we find the B almost two seconds off the V 40's pace and nearly three seconds slower than the BMW. The B is an efficient car though, in fact it is the most efficient here, though not by a big margin. It leads the other two cars by just a kilometre to a litre. The B-Class isn't as good as the Volvo when it comes to comfort though. The Merc has a smaller, less cushy and a less supportive rear bench. It also doesn't get a central armrest, a bad omission for a luxury car. Then there's the ride. Thanks to smaller wheels and higher profile tyres compared to the petrol B-Class, the diesel rides better, but it is still harsh and loud over bad roads, road joints and potholes. One can also feel it jiggle taking away from the comfort factor further. The BMW can't match the Volvo either. It has more comfortable seats and it vibrates less over poor roads compared to the B-Class, no doubt. It also manages to iron out most bumps better, but when the going gets rougher, the X1 begins to lose composure. Like the B - but with lesser intensity - the BMW too returns a crashy ride, and though the thumping isn't as bad as on the Merc, the ride remains riddled with vibes and noise like the B. The Volvo isn't plush in the traditional or American sense either, and the underlying firmness in the ride can be felt almost all the time. However, it is quiet. The car doesn't vibrate, jiggle or wallow over poor roads. And the absorption abilities displayed by the suspension are best in class. The really bad potholes can cause the suspension to crash at times, but the impact transmitted to the passengers is a lot lesser in comparison to the other two cars. The V40 also has the best seats. The rears ones are large, cushy and comfortable to be in, even on longer drives. The Volvo's happy suspension story doesn't end here though, because the car impresses with its handling as well. Now for the record, none of these cars handle poorly. In fact, none of these cars will give you reason enough to complain when driven fast either in a straight line or on a winding road. The grip levels for all three cars are fantastic, and the body roll, the steering alertness and the brake feel and progression on all three, again, is very good. The Volvo though has a slight edge. It has sharper turn in, better steering response and feel, and it's less fidgety around bumpy corners giving the V40 a more alert but stable feel, especially when drive hard. I personally like the X1 too, plainly because it is the only rear wheel drive car here. But, handling is one aspect which you cannot base your buying decision on when it comes to these cars. Before we give you the verdict on which is the best of the three cars on test here, let's analyse this a little logically. Today, visual appeal matters a lot; after all, the car we drive speaks volumes about who we are. So, a car must have road presence to charm the crowd but with an interior that feels welcoming, plush and comfortable to its owner. And the V40 scores highest on both these counts. It's equally important for a car to be fun. It needs to have involving handling, a power packed engine, a responsive gearbox, a steering that's alive and braking and straight line stability that's reassuring. The X1 is without doubt, the best car in this regard. Then there's the question of comfort. A plush ride, a quiet cabin, pampering convenience and comfort features, and of course spacious seating, all contribute towards comfort in a car. And besides space, which is the B-Class' strong point in this test, it's the V40 that manages to deliver on all comfort related counts better than the competition. Finally there's the cost of buying and the cost of running. The B-Class with its lowest pricing and highest fuel efficiency is the most cost effective purchase. And it should be the one to go for as the second car in a household. The BMW on the other hand is the most expensive and the least efficient. But, it is also the only rear wheel drive car here for one to get silly on a non-public road. The X1 then has to be an emotional purchase above all else. The most sensible, logical and value purchase though is the V40. It is the ideal first step towards the world of luxury automobiles. It's plush, feature rich, luxurious and though it could do with a better engine and gearbox, it still is fun to drive. Moreover, it has won the most number of bouts in this test against both the BMW and the Mercedes which gives it the overall win in this test.